We can provide the gravel you need for projects of any scope and size in Collingwood. Having the right kind of gravel for your specific project requirements can make a big difference in the efficiency of your construction and in the finished results. At Flesherton Concrete Products, we have been providing high-quality solutions for our customers in Collingwood, Ontario for over 30 years, and we can provide the gravel you need for projects of any scope and size. Products – Whether you require A gravel, B gravel, or crushed stone, you’ll find the products you need with us at Flesherton Concrete Products. We manufacture and supply our gravel, so it’s easy to get the supplies you need without hassles. Services – We work hard to provide our gravel and other aggregates at competitive prices while also maintaining a high level of customer service. 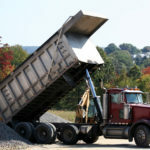 Whether you need a dump truck load delivered to your property or you require a large volume delivered for a construction project, we are equipped to meet your needs. Quality – It’s important to us that you feel confident you can get quality gravel and other aggregates any time you call us for your project. We’ll be happy to answer your questions and schedule timely delivery of your gravel in Collingwood. Our gravel is ideal for any number of project types, from building a gravel driveway to laying a home’s foundation and other larger-scale operations. Contact us at Flesherton Concrete Products today to see why we are your top choice for all your sand and gravel, aggregates, and concrete products. From construction to landscaping and specialty projects, our team will show up with the supplies you need to achieve your goals. At Flesherton Concrete Products, we offer gravel to customers in Collingwood, Wasaga Beach, Flesherton, Orangeville, Owen Sound, Barrie, Stayner, Mulmur, Shelburne, and Mount Forest, Ontario.